Did you know that if you are driving at a speed of 65 miles per hour, you are traveling at approximately 100 feet per second? At this speed, if you were to look down for a few seconds, you would travel the length of a football field. A lot can happen in a very short time. Part I of this article was devoted to understanding Federal Motor Carrier Safety Administration (FMCSA) expectations of carriers regarding regulatory compliance and the methodology FMCSA uses to measure carrier compliance and assign carrier safety ratings. Imagine this: A small-town retail store owner struggling to find responsible, dedicated employees is approached by a key employee who generally is engaged in her job and has tenure. She asks for four weeks off for what in the employer’s mind is minor surgery. With new hazards emerging weekly, ensuring safer, more secure environments is more challenging than ever before. The importance of Personal Protective Equipment (PPE) is constantly being brought to the forefront by natural disasters, such as wildfires, flooding in America’s heartland, tornados, and hurricanes; as well as health concerns about pathogenic microorganisms, such as MRSA and H5N1 virus (avian flu). A company’s brand name is often its most valuable asset. A brand name takes years to develop but can be irreparably harmed in an instant if a trusted brand causes harm to the consumers who have grown to rely on it.When a company learns that one of its products has caused harm to one or more of its customers, it needs to take swift action to prevent future harm to its consumers and to salvage its brand name. Employers increasingly use incentives to motivate their workers to participate in health and wellness programs.Participation is only half of the story, however: A greater variety of incentives is being offered, and more of them are awarded for completing a program (such as weight loss, smoking cessation, or a health risk assessment) than in the past. Managers are looking for simplified ways to promote safe work practices while maintaining production levels. Too often, current safety programs that begin with great intentions turn into a paper-tracking nightmare or the documentation becomes the ends to the means rather than having a positive impact on employee performance. In every business environment, there are certain health and safety risks that employees expect to have addressed by their employers: Sidewalks must be shoveled and salted after snowstorms, safety goggles and masks must be supplied in the presence of airborne chemicals, and facilities must be kept clean and up to code to minimize accidents. Protecting the hearing of employees is extremely important. Although loss of hearing through aging usually follows a normal pattern, when we are exposed to excessive noise, hearing loss can occur prematurely from excessive exposure to noise in the workplace. Hearing loss is a serious hazard that is often painless, progressive, and permanent. The last thing most gals think of when they’re getting dressed in the morning is safety.We women, some of us highly influenced by the styles we see in the media, are usually concerned about wearing things that are flattering, fashionable, and fit our unique shape. However, speaking from experience, I believe safety should be the most important “fashion” consideration, especially when dressing for your job.Your safety (and possibly that of others around you) counts on it! By now you have probably heard of Second Life, the online community created by San Francisco-based Linden Lab in which people, or their animated representatives, can buy virtual “goods” and “land,” construct homes and buildings, conduct business, and essentially live second, imaginary lives—spending, and sometimes making, real money in the process. Traditionally, when operators or maintenance personnel required access to the hazardous section of machinery, employee health and safety regulations required removing all energy to that machinery. 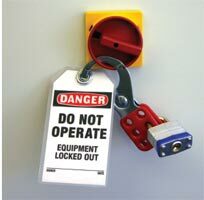 It is tempting to think in simple terms about lockout/tagout—that you merely need to power down a machine and put a lock through the deenergized disconnect to achieve safety. The reality is that it’s not that simple, and it’s dangerous to think otherwise. In his epic work "The Waste Land" (1922), T.S. Eliot wrote convincingly that “April is the cruellest month,” but a case can be made for September. Throughout American history, all varieties of disasters have transpired in this ninth month of the year—from shipwrecks to plane crashes to terrorist attacks—the aftermath of which have changed the way we live, work, and simply function as a society. Some of these changes have been subtle, others, such as the events of 9/11 seven years ago, drastic. Warriors? Safety seems like warriors sometimes, the way we champion causes to reduce employee injuries. We display dogged determination for working in the future, planning long before other teams consider new standards of working safely. Problem solvers? You bet. We work on any problem and try to resolve it, often with no fanfare. On Sept. 24, 2007, OSHA issued a Safety and Health Information Bulletin, Respiratory Disease Among Employees in Microwave Popcorn Processing Plants. The purpose was to inform employees and employers about the potential hazards of food flavorings containing diacetyl, recommend exposure controls to reduce exposures to food flavorings containing diacetyl, and inform employers of applicable mandatory OSHA standards. What would possess a person to go toward a volcano that may erupt? A death wish? Or could it instead be a wish to preserve life? Quarrels at home, while driving, and at work sometimes escalate into dangerous and violent arguments. Those caught in the middle—including co-workers, family members, and emergency responders—are at high risk. When time is short and resources are limited, this hand-held device brings the lab to the scene. The American landscape was forever changed by the events of 9/11.With the anthrax mail scare that followed shortly afterward, one company found itself in a unique position to help the emergency responder community with a portable chemical identifier called HazMatID™. Treating commercial truck drivers who have sleep apnea significantly lowers their health care costs, lowers their preventable accident rate, and reduces their turnover.While the Federal Motor Carrier Safety Administration revised the hours of service rule in this decade to reduce fatigue-related commercial motor vehicle crashes, the evidence in two recent studies is an even more compelling reason for trucking companies to address sleep apnea.